The StarFire™ 6000 Receiver offers improved pull-in performance compared to its predecessor. That means the operator spends less time waiting for the receiver to achieve full accuracy and can get high-precision jobs like planting and nutrient application started even faster. It also means less time waiting to reacquire full accuracy after an extended shading event, such as running next to trees while planting headlands. NOTE: Pull-in time specifications are based on a clear view of the sky, no signal interference, no scintillation, and ideal atmospheric conditions (free from solar disturbances and other ionospheric/tropospheric activity). 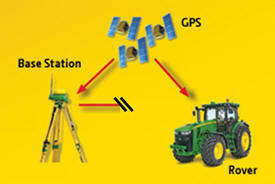 Performance may vary based on GNSS constellation health. 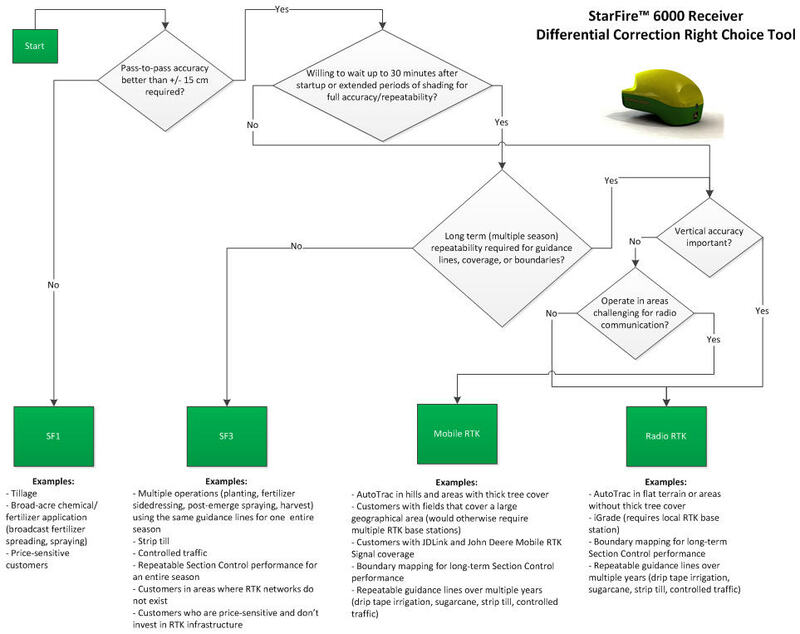 The figure below displays test results from a case study that compares the pull-in performance of a StarFire 3000 Receiver using SF2 next to a StarFire 6000 Receiver using SF3. NOTE: This testing was completed using static receivers in an environment with no shading or signal interference. Results will vary depending on operating conditions. The values shown in the figure below are absolute 2D accuracy with a 90 percent confidence interval, they should not be compared to pass-to-pass accuracy values used elsewhere in this document. The StarFire 6000 Receiver has two features that reduce the amount of time required to achieve full accuracy, or pull-in, when using SF1 or SF3. Hours on after shutdown is a user-configurable feature that allows the receiver to remain powered on for up to 24 hours (0-, 3-, 6-, 12-, and 24-hour options) after the machine is powered down. If the machine is parked outside and the receiver has a clear view of the sky during this time it will continue to track satellites and retain accuracy. There is no need for the receiver to complete a new pull-in if the machine is started within this defined period. QuickStart is a feature that can help reduce StarFire pull-in time if hours on after shutdown has expired or is not used. QuickStart works when the machine is shut down and the receiver is able to save a known location (must have a clear view of the sky and good SF1/SF3 accuracy). When the receiver is powered back on it can recover to full accuracy in less than 6 minutes if the machine is not moved during this time window. There is no need for the receiver to complete a new pull-in if the machine is not moved before the QuickStart completes. The StarFire™ 6000 Receiver offers multiple differential correction signal levels to match receiver performance with the needs of the operation. NOTE: Horizontal pass-to-pass accuracy specifications are 1D and are based upon a 15-minute time period, 95 percent confidence interval, clear view of the sky, no signal interference, no scintillation, and ideal atmospheric conditions (free from solar disturbances and other ionospheric/tropospheric activity). Performance may vary based on GNSS constellation health. NOTE: Radio RTK horizontal accuracy specification is based on the maximum supported baseline (distance from the RTK base station) of 20 km (12 miles) and a properly installed RTK base station. NOTE: Mobile RTK horizontal accuracy specification is based on a 20-km (12-mile) baseline (distance from the nearest network RTK base station). Performance will vary based on network geometry. What does pass-to-pass accuracy really mean for the user? Pass-to-pass accuracy defines how accurate the receiver is at calculating its position over a relatively short (15-minute) time window. 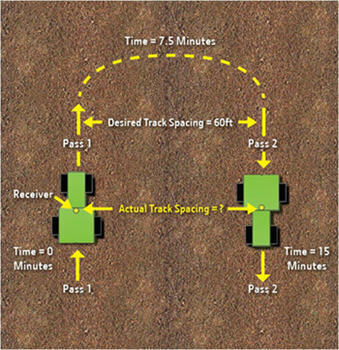 For each point in time during that 15-minute window, a pass-to-pass error value is calculated based on the difference between the desired track spacing at the receiver and the actual track spacing based on the receiver’s calculated position. The error values for the entire 15-minute period are combined and the pass-to-pass accuracy value is defined as the 95 percent confidence interval of the data set, meaning 95 percent of the error values are less than or equal to the specification. Pass-to-pass accuracy is measured at the receiver and does not take into account additional error sources such as AutoTrac™ control system error, ground conditions, or implement drift. 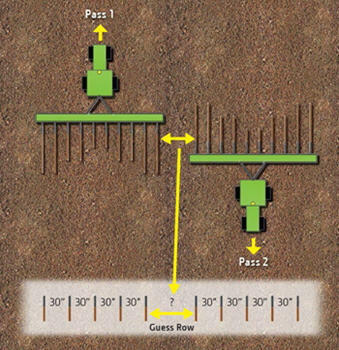 Pass-to-pass accuracy has a direct impact on guess-row spacing during jobs like planting, strip till, or fertilizer application, which can have a direct impact on yield potential. Guess-row spacing is also critical for operational efficiency and reducing crop damage in operations that mix implements of various widths. What does repeatability really mean for the operator? Repeatability defines how accurately the receiver can calculate its position over a relatively long time window. Repeatability is measured at the receiver and does not take into account additional error sources such as AutoTrac control system error, ground conditions, or implement drift. In-season repeatability is critical when using AutoTrac for multiple jobs throughout the growing season. One example would be creating AutoTrac guidance lines during planting, then using those same guidance lines to complete subsequent jobs such as side-dressing fertilizer, post-emerge spraying, and harvesting. Long-term repeatability is critical when mapping interior and exterior boundaries for later use as input to John Deere Section Control on planters, sprayers, and fertilizer applicators. Long-term repeatability is also critical for growers that use the same AutoTrac guidance lines over multiple seasons for operations like subsurface-drip irrigation, controlled traffic, or alternating planter spacing between the rows from a previous season. 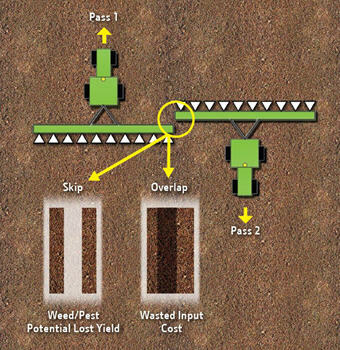 Pass-to-pass accuracy also has a direct impact on the amount of skip or overlap that occurs during operations like spraying, fertilizer spreading, or conventional tillage, which has a direct impact on yield potential and input costs. SF3 In-season repeatability modeling verified? NOTE: Repeatability specifications are based on a 95 percent confidence interval, clear view of the sky, no signal interference, no scintillation, and ideal atmospheric conditions (free from solar disturbances and other ionospheric/tropospheric activity). Performance may vary based on GNSS constellation health. NOTE: Radio RTK repeatability specifications are based on a properly installed RTK base station and a base station position that has not been modified after initial setup. NOTE: Mobile RTK repeatability may be impacted by updates to network reference frames or adjustments for tectonic plate movement. Networks in some areas of California, Oregon, and Washington will be updated more frequently due to tectonic plate movement. NOTE: SF3 repeatability specifications have been validated through at least a 9-month period. A guidance-line shift may or may not be required after a period longer than 9 months. 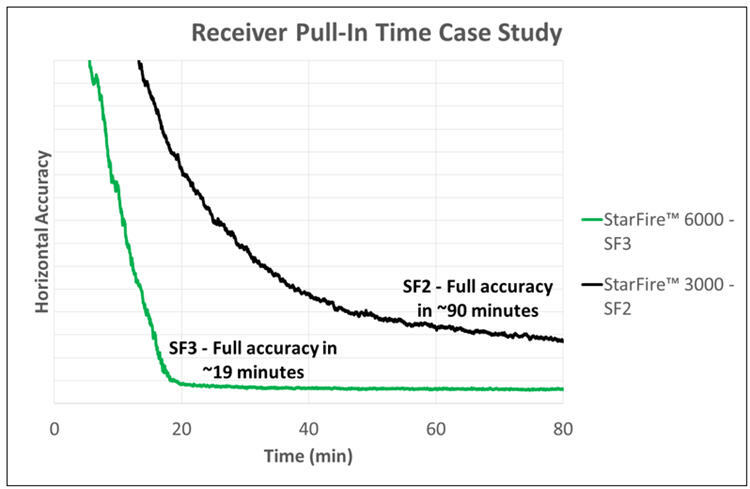 SF3 repeatability claims are only valid after the receiver has completed a full pull in and is operating at 100 percent accuracy. SF3 repeatability may be impacted by large unpredictable geological events such as earthquakes. The StarFire™ 6000 Receiver has 252 channels and tracks both GPS (United States) and GLONASS (Russia) satellites. Tracking as many GNSS satellite signals as possible increases the chances of retaining accuracy and performance in challenging areas such as when operating near trees. The StarFire 6000 Receiver is capable of simultaneously tracking correction signals from up to three StarFire correction satellites. The receiver tracks and uses correction signals from all StarFire satellites in view and intelligently chooses one that will deliver the best performance. 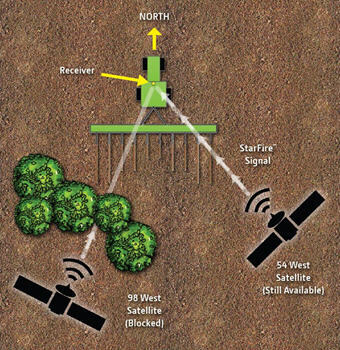 When the receiver moves into an area where the primary StarFire signal is blocked such as near a tree line, the receiver will automatically switch to an alternate StarFire signal (if visible) to help maintain accuracy and performance. Compare this to the previous StarFire 3000 Receiver that was only capable of tracking one StarFire signal at a time and could wait up to four minutes to initiate the switch to the next available signal. 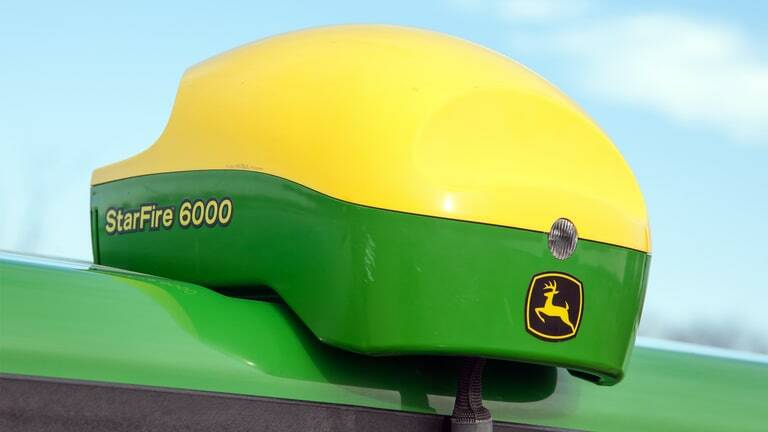 With the StarFire 6000, the user gets improved performance and uptime when operating precision agriculture systems like AutoTrac™ assisted steering system and Section Control in challenging areas when compared to the previous StarFire 3000. 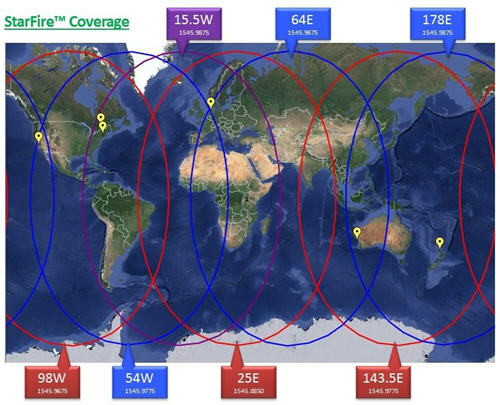 NOTE: Some locations have visibility to two StarFire signal satellites and some locations have visibility to three. The StarFire 6000 is capable of coasting through StarFire signal outages of up to 20 minutes in duration in case the producer needs to operate AutoTrac in an area where all StarFire signals are temporarily blocked by trees or other obstructions. Accuracy will slowly degrade during this 20-minute period and will be shown to the operator via the accuracy indicator on the display. The StarFire 6000 also delivers a faster and more robust rapid recovery feature, which allows the system to quickly recover to high-accuracy performance after losing track of GPS/GLONASS signals for short durations. This means the operator spends less time waiting for the system to recover to full accuracy after temporary shading events, such as turning around near a headland shaded by trees. RTK operators have experienced the value that RTK Extend provides when operating in areas where communication with the RTK base station or mobile RTK network is challenging, such as in hilly terrain, areas with many trees, or areas with poor cellular connection (mobile RTK). The StarFire 6000 makes another step change in RTK Extend performance compared to its predecessor, delivering RTK Extend for up to 14 days.